Pensacola, Fla. (January 9, 2018) – Visit Pensacola is pleased to share that the Gulf Islands National Seashore has been named USA Today’s 10Best Readers’ Choice 2018 Best Florida Attraction. This achievement follows 20 destination nominations from an expert panel followed by a period of public voting. Other top nominations included Clearwater beach – Clearwater, J.N. “Ding” Darling National Wildlife Refuge – Sanibel and Dry Tortugas National Park. “This accolade shines a national spotlight on the gem that exists in our very own community among the numerous other awards we have received just this week. Locals and guests who have experienced the Gulf Islands National Seashore have made that clear with their overwhelming response of votes,” President of Visit Pensacola Steve Hayes said. “Being voted #1 Best Florida Attraction confirms what most of us already know – that the Gulf Islands National Seashore is a phenomenal place, with its incredibly beautiful beaches and fascinating forts. The best part is that it belongs to all of us to experience and enjoy,” National Park Service Superintendent Dan Brown said. With sugar white sandscapes that stretch from Perdido Key to Pensacola Beach’s Fort Pickens National Park and beyond, guests can enjoy emerald green water, diverse wildlife and landscapes, architectural history and peaceful seclusion. 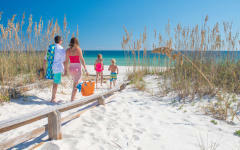 For more information on the Gulf Islands National Seashore accolade, visit www.beachvote.com.